The good news is that most of these hangers-on don’t hang on for very long. More than one-third of senior aides in the Trump White House have been fired, quit or been reassigned in the first year — a record. 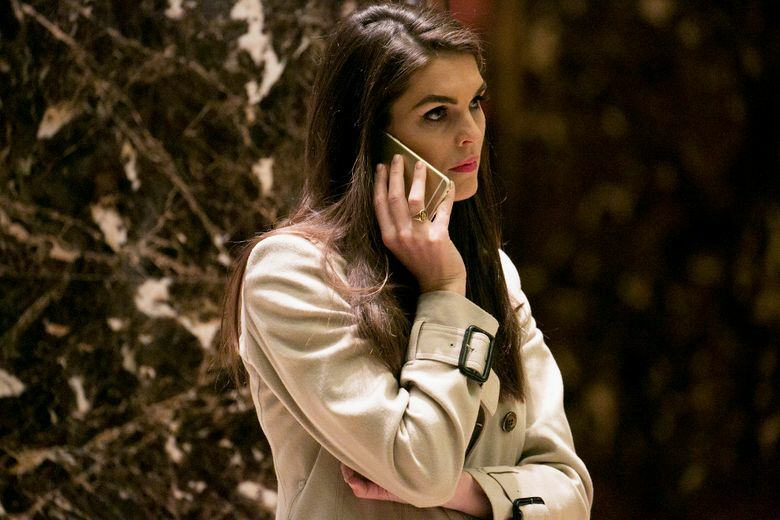 WASHINGTON — Hope Hicks, a former model who handled public relations for Ivanka Trump’s purses and shoes, was President Donald Trump’s longest-serving top aide, attending top-level White House decision-making meetings and crafting communications policy. She testified to Congress this week that she sometimes had been required to tell “white lies” as part of her job. The next day, she said she is resigning. Although Kushner is supposed to handle Middle East peace, NAFTA negotiations, innovation, relations with China, Mexico, Iraq and Saudi Arabia, government reorganization and criminal-justice reform, he has been stripped of his access to the nation’s top secrets because intelligence agencies can’t posit he is not subject to blackmail from foreign operatives. It remains to be seen if Trump overrules his chief of staff John Kelly and lets Kushner to continue knowing everything. Kushner’s wife and Trump daughter, Ivanka, still making money from her own businesses, also is a top adviser to the president. Her portfolio includes working on behalf of women but she says it’s “inappropriate” to ask what she thinks of the #metoo movement and the 19 women accusing Trump of sexual harassment or assault because she must believe her father’s denials. Some complain Ivanka is “playing government.” Most recently she served as head of the U.S. delegation at the Winter Olympics closing ceremony in South Korea, conveying the latest U.S. thinking on North Korea’s efforts to become a nuclear power. Trump’s daughter-in-law Lara has a key role in his re-election campaign apparatus. (Trump announced his campaign shortly after being inaugurated.) His new campaign chairman was in charge of digital media and marketing for Trump in 2016. The president’s sons Donald Jr. and Eric, running Trump’s business for him, are involved in politics and travel abroad defending their father and promoting the business. The president is pushing his personal pilot to run the Federal Aviation Administration, which is trying to spearhead a controversial $36 billion modernization plan through Congress. Also, Trump wants to privatize the nation’s air controllers. Trump put former campaign aides, some without college degrees and none with farm experience, in top posts at the Department of Agriculture. A friend of Melania Trump was given $26 million to help run Trump’s inaugural events even though another firm that has handled the event for years also got $26 million. Although she had no government experience, she then got White House access as a top adviser helping a first lady with no government experience. She has just been let go. To modernize government technology — a huge undertaking — Trump hired a Baltimore real-estate mogul’s son married to Ivanka’s college friend. Trump put Andrew Giuliani, son of the former New York mayor who is a big Trump supporter, for a White House job handling public liaison. The younger Giuliani, who sued Duke University for kicking him off the golf team and lost, has no government experience. This pattern of handing out government jobs like mints to loyal friends and relatives does not seem to upset millions of Americans who wanted “the swamp drained” because the president himself successfully campaigned on having no experience or qualifications for the most important job in the world. So, if some of the hundreds of loyal Trump sycophants are still in their cushy jobs in 2021 or 2025, why, then they will be the bureaucrats the next president vows to throw out.